Peacefully at the Trenton Memorial Hospital on Wednesday, February 6th, 2019, Dorothy Post (nee Waltherr) at 90 years of age. Predeceased by her partner Tom Mathieson. 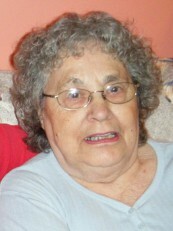 Beloved mother of Sandra Lyon and Robert Post (Terry Williams). Dear grandmother of Sarah and Rachael. A Funeral Service will be held at MacCoubrey Funeral Home, 30 King St. E. in Cobourg on Wednesday, February 13th, at 4 pm with visitation for one hour prior to the funeral, from 3 to 4 pm. Reception to follow in the funeral home reception centre and interment to take place in the spring. Those wishing may make a memorial donation to the Ontario Lung Association. Condolences received at www.MacCoubrey.com. Wednesday February 13, 3 p.m. - 4 p.m.
Wednesday February 13, 4 p.m.